Where to begin tracing your family history when your father has grown up with no known relatives beyond his immediate family — and knows little about his roots in wartorn Eastern Europe? Faced with this dilemma, Elisa Jakymin and her sister Anna reached out to an overseas genealogist for help. Here, she recounts the discoveries that followed, tracing the impact of World War II on two Ukrainian teenagers and the circumstances which culminated in them building a new life together in Australia. A selection of anonymous photos, a handful of dated letters and a marriage certificate. These were the historical documents which marked the beginning of my family’s journey to learn more about the circumstances which led my paternal grandparents, Olena and Jan Jakymiw, to Australia. Growing up, my dad’s side of the family was always a bit of an enigma. Much of my childhood was characterised by Ukrainian lessons at Saturday School in Lidcombe, learning the art of Ukrainian dancing on Monday nights and spending the religious holidays of Easter and Christmas with my grandparents in celebration of our Ukrainian heritage. While I shared the same surname — albeit an anglicised version for aid of pronunciation — I knew very little about my grandparents’ lives prior to them emigrating from Ukraine to Australia. The war had wrenched them from the comforts of their homeland, friends and families. Given the difficult circumstances which they must have endured, it was understandable that they talked very little about their former lives. Fast forward to 2017, and with both grandparents having passed on a number of years ago, the opportunity to probe them about specific details of the war and of their families had long since elapsed. Inspired by tools which have brought genealogy to the masses, my elder sister Anna decided to get in touch with Serhij, a Ukrainian-based genealogist, in an attempt to uncover what was lost so many years ago. Despite locating Serhij through a Google search, Anna put her reservations aside and placed her trust in this historian located on the other side of the world. What began as a few historic documents, and a desire to learn about the circumstances which had led my grandparents to Australia, evolved into a series of serendipitous leads and conversations which have connected my family with relatives spanning across Poland, Ukraine, Germany, Lithuania and Russia. With each new discovery, we gradually pieced together the stories of our family’s ancestry puzzle, beginning with the circumstances which had brought them to Australia. Shortly after the onset of World War II, families in the tiny village of Mizyn Stary located near Dolyna, bordering Ukraine and Poland, were warned that Nazi soldiers were planning on invading each household. The soldiers were abducting the eldest child from each home for forced participation in the labour camps which were rapidly taking over Germany. Preparing for the worst, Olena’s mother hid her two eldest daughters, aged 22 and 20 years, to prevent them from being abducted. As Olena had only recently turned 16, it was assumed that she was too young and as such safe from abduction. Olena Jakymiw pictured in 1945. 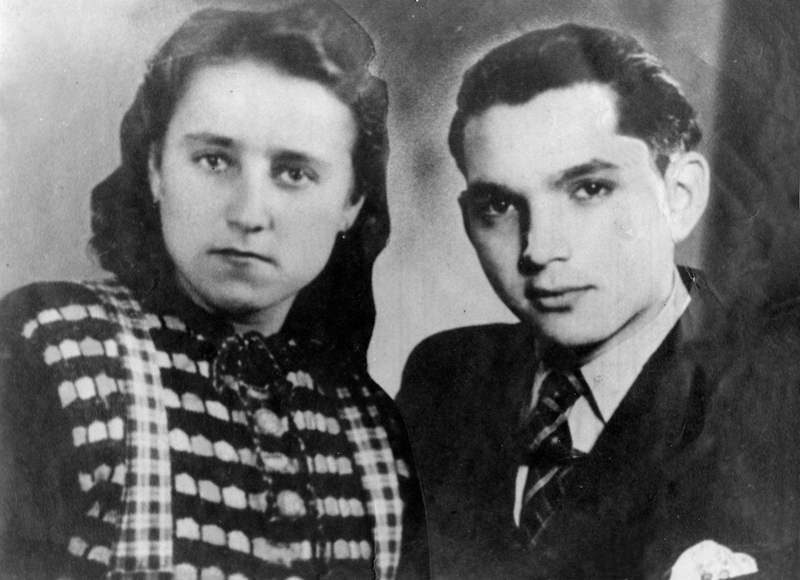 Entering the family’s home in the middle of the night, the Nazi soldiers took Olena by force from her slumber. Given her sisters were nowhere to be found, and the fact that Olena was considered tall for her age, she would — by default — qualify for the German labour camps. At just 16, Olena was torn from the comforts of her family home with only the clothes on her back, in addition to a steel container of milk gifted from her mother. Despite a narrow attempt to escape, as fate would have it, Olena would soon return to the holding compound to retrieve the steel container which she had left behind, being captured in the process. She would never see her mother or father again. For several years throughout the war, Olena worked as a kitchenhand and housekeeper for a German family who treated her well, even allowing her to write home to her family in Ukraine. During this time, Olena met others who had suffered at the hands of the Germans and like her were foreigners in a strange land away from the familiarities of home and family. Having experienced similar circumstances was the common bond that brought them together. It was during this time that by chance, or perhaps destiny, Olena accompanied her girlfriend on a date. During this chance outing, Olena was introduced to Jan, who took more of a liking to her than to his original date! Jan Jakymiw, pictured in 1945.